This is a design I found on Pinterest. 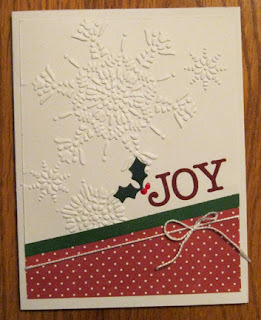 There's that snowflake embossing folder again and this time I cut it at a slant and added some color with patterned paper. The holly and letters are die cut and I added dimensional paint for the berries, some string and a narrow strip of dark green cardstock that matched the holly. I like this one a lot and used made them until I ran out of the red paper. Joy to the world!